Adjusting your position and posture can help. When it comes to pain in your spine, the lower back gets all the attention. But the top of your spine—your neck—is equally vulnerable to pain. It's especially important to be aware of this as we spend more time with our heads bent low over computers and cellphones. "For every 10 degrees forward the head is from a neutral position, the weight of the head on the neck increases about 10 pounds. This can place a great deal of strain on the muscles, ligaments, joints, and intervertebral discs in the neck," says physical therapist Amy Devaney, of Harvard-affiliated Massachusetts General Hospital. Improve range of motion and ease tension. These stretches help relieve tight neck muscles. 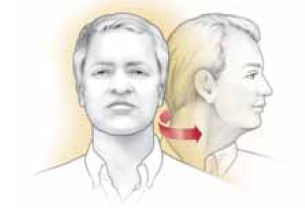 At the same time, they reduce compression of the vertebrae caused by such tension, and they help maintain or extend the neck's range of motion. Start by facing forward. Turn your head slowly to one side. Hold the position for three seconds and return to the original position. Turn your head slowly to the other side. Hold for three seconds and return to the original position. Repeat 10 times. Ask the doctor: How can I prevent leg cramps at night?